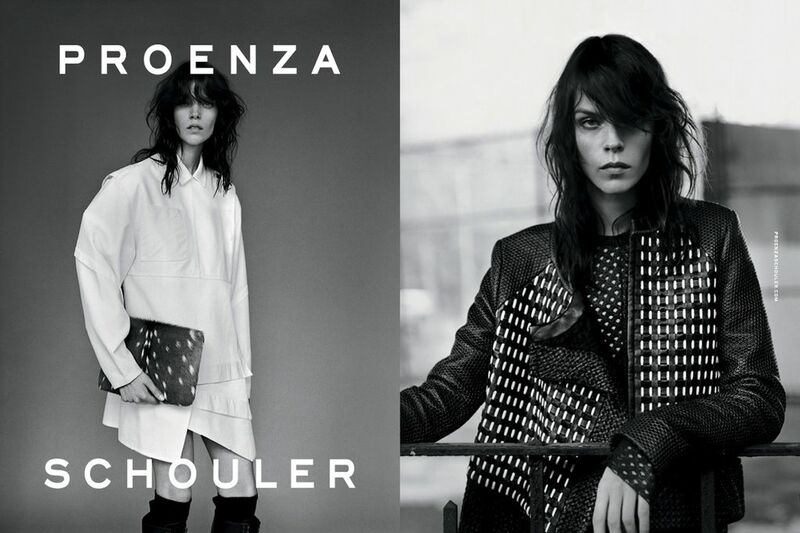 innovation down to thread, proenza schouler is the epitome of modern style in the american fashion realm. who better to serve as the brand’s face in the lane modern style than meghan collison of next models ny? through the lens of alasdair meclellan, with styling my marie chaix meghan completely embodies the downtown cool proenza. with hair & make-up by paul hanlon & diane kendal, collison stuns with slightly undone hair, casual chic presence all set to a greyscaled theme. from the satin brocade dresses to the incredibly chic kimono-weaved-karate coats, this collection was identified as one of my favorite fall collections of the coming season. ultra-hip, stylistically fresh & powerfully detailed, the collection is one that represents the potential of american fashion for the future. i’ve always been fascinated by meghan’s look, considering the range of beauty that is now showcased in the world of high fashion. i am naturally drawn to natural beauty, but recognize that fashion is more about what men & women can be transformed into in these days. models are expected to serve as interesting, rather than looking natural. interesting is, well, an interesting word to use when thinking of models on the scene today and through the 2000’s. language is powerful in every sense, it really shapes your level of understanding. models today are described as interesting, but from a societal sense might be seen as odd or even ugly outside of fashion. in the golden era of modeling during the 90’s, models were born with naturally, extraordinary physical beauty. with the emergence and greater utilization of cosmetic surgery by men and women alike; the definition of natural has even been questioned when speaking on physical beauty or features you’re born with. what i find so beautiful of meghan collison is that she is a unique combination of natural beauty & those interesting features that have become so greatly in demand in high fashion. that hybrid combination of classic beauty with modern forms of beauty is what meghan exemplifies, which is truly beautiful. 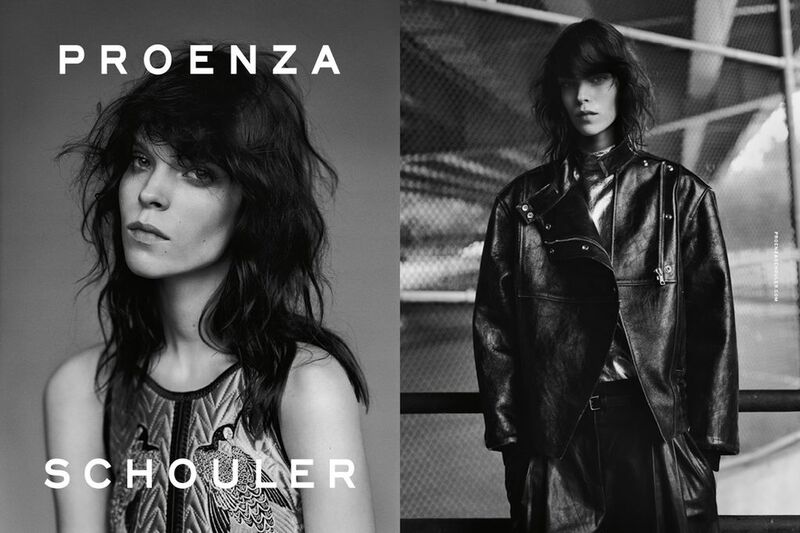 there couldn’t have been a more perfect face to fit the ultra-cool of proenza schouler & this campaign is among my favorites this season. included last season among the cast of prada’s spring campaign, collison continues her upward climb with this campaign and another campaign booking this season with moncler. with show season rapidly approaching, meghan will be scratching a few catwalks. as a favorite face of mine, joan smalls continues to redefine what it means to be a supermodel in today’s competitive world of modeling. as the new face of fendi for the fall 2012 season, smalls’ image and visibility are at an all-time high. last season, smalls was joined by model, saskia de brauw for the prestigious chanel campaign & continues to serve as a favorite of karl lagerfeld appearing for fendi. both chanel & fendi are labels under lagerfeld’s creative guidance as director and those who know anything of high fashion will agree, karl spares no opportunity to give his favorites shine. a favorite across the board, smalls is a regular in the pages of american vogue as well. with recognition from both lagerfeld and wintour, two of fashion’s most powerful figures, it’s very likely that joan could completely alter the landscape for other women of color in the lane of high fashion. with no end in sight & popularity that seems to grow with each season, magazine cover and campaign, i am extremely excited to see the success that joan has been able to attain as a model with undeniable presence. stunning as ever, though not her best, joan continues to slay. aesthetically, the campaign is not one of fendi’s greatest, but the presence of joan is a statement in itself. i have questioned the ability of karl lagerfeld as a photographer, considering the number of tremendously talented photographers that don’t get the opportunity to work with chanel or fendi, considering his hogging of that opportunity. that said, karl- i have additional respect for you considering the number of opportunities you have allowed joan to shine. congratulations to joan and her unstoppable agent over at IMG. myself and the readers of jeremydante.com have long supported joan and applaud her striking performance. the house of prada reigns supreme as trendsetter. while some collections might seem over the top or too minimal, it has been proven in the fashion market that the trends created by muiccia prada & her team are those that trickle for many seasons to follow. this season, prada created an imaginative campaign with the photographic aide of steven meisel. between the commercial & the campaign images, which you’re sure to see splashed on billboards and magazines alike in the coming months, prada continues to amaze. between the ombré hair extensions & the beautiful print which appears as a headlining element in the collection, the approach this season is that of pure unadulterated modernism. meisel has been able to flex creatively through a well executed broadcast of an image as well as a direction with the house of prada. much like his work with italian vogue, you don’t know what to expect from season to season, or month to month. i love this campaign in all aspects- the make-up, the hair, the set, the music. it’s all so vividly prada as a full force representation of the collection. i just wish the menswear campaign was as exciting. as solid as the casting of this campaign may be, porcelain skin galore- i would love to see prada inject more ethnic models into what they do. this, of course, has always been a desire on my end & the basis of most discussions on my site. i understand the need for showcasing a certain image or direction, but the consistent absence of color in fashion is becoming a tiring discussion to bring up. as many campaigns you’ll see this season, very few represent our community. while the images that these brands create may be beautiful, it still promotes not only an unrealistic but biased view of beauty. im all for fantasy, but isn’t true beauty showcased through diversity? as popular and much more visible as models of color have become in the last three years, prada is one powerful label that has not shifted even in the slightest. the refusal to represent these forms of beauty is a big statement. as we’ve seen through the years, milan is among the hardest fashion capitals for models of color to work in. that’s not to say there aren’t exceptions but still. where are we as individuals, as varied shades of ethnic beauty in high end advertising?